This publication summarises information on current varieties of the major winter crops grown in Victoria. Sources of additional information are listed in each chapter. Local advisers are also a key resource for information relevant to individual localities. This publication aims to prompt growers to ask themselves, 'Am I growing the best variety for my situation?' Use it as a guide for discussion with consultants, advisers and marketing agents. NVTs provide independent information on varieties for growers. The aim of each NVT is to document a ranking of new and widely adopted varieties in terms of grain yield and to provide grain quality information relevant to delivery standards. NVTs are also used by pathologists to determine disease resistance ratings used in the Winter Crop Summary. Conducted to a set of predetermined protocols, NVTs are sown and managed as close as possible to local best practice such as sowing time, fertiliser application, weed management and pest and disease control, including fungicide application. NVTs are not designed to grow varieties to their maximum yield potential. It is acknowledged that an ongoing project of this type would not be possible without the cooperation of farmers prepared to contribute sites and who often assist with the management of trials on their property. Use https://grdc.com.au/NVT-Victorian-Winter-Crop-Summary to ensure your link remains current and up-to-date! 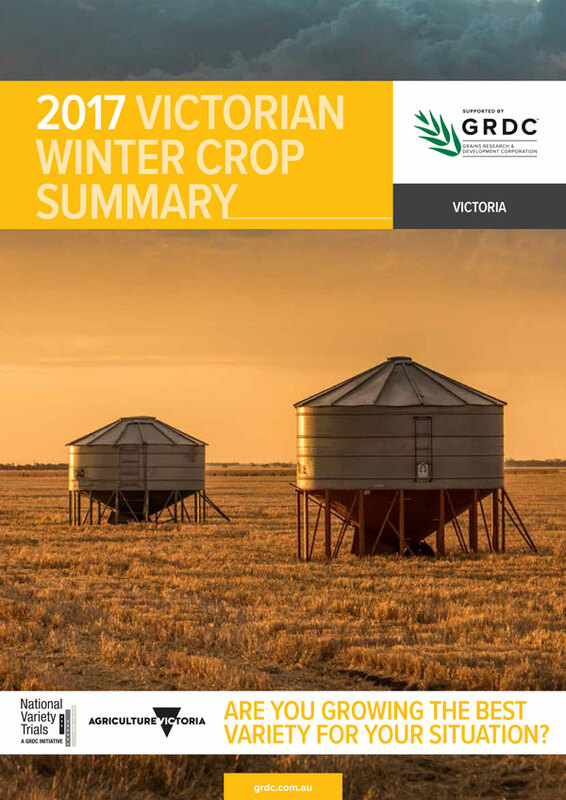 3.64 mbNVT Victorian Winter Crop Summary 2017This publication summarises information on current varieties of the major winter crops grown in Victoria. Sources of additional information are listed in each chapter.